For the first time since 1984, U.S. Marines hit the beaches in Beirut Thursday to help evacuate thousands of fleeing Americans, as the first planeload of U.S. citizens arrived back in the United States. Meanwhile, Hezbollah guerrillas wounded three Israeli soldiers in two separate clashes in southern Lebanon on Thursday, while Israel's army chief said the offensive in Lebanon would not end until Israel's security is restored, and vowed to destroy Hezbollah's arsenal and military capabilities. Israeli artillery continues to pound Hezbollah positions in Lebanon, reports CBS News correspondent Robert Berger (audio), and there was again fighting on the ground inside Lebanon. Hezbollah said in a statement that its guerrillas foiled a new Israeli attempt to stage a ground attack and destroyed two Israeli tanks. It claimed to have repelled Israeli ground forces as they tried to enter the Lebanese border village of Maroun al-Ras early Thursday. 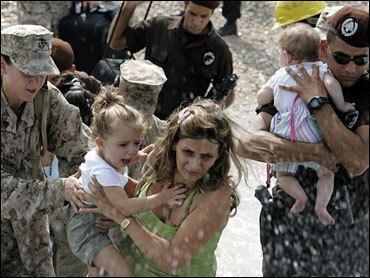 The international effort to evacuate the remaining foreigners in Lebanon also continued. Boats were forced to lined up outside Beirut harbor and also had to wait before docking in Larnaca, Cyprus. Larnaca was so crowded that some ships were being diverted to the Cypriot port of Limassol, and CBS News correspondent Sabina Castelfranco (audio) reports Cypriot authorities were warning of a humanitarian crisis because of the large numbers of evacuees. In Beirut, the U.S. Embassy hoped to move twice as many people Thursday as it did Wednesday and then double again the number Friday, reports CBS News correspondent Elizabeth Palmer. The USS Nashville has arrived in Beirut, the latest ship to come to the rescue of Americans trapped by the fighting. Hezbollah has created a "state within a state" in Lebanon and must be disarmed, Lebanese Prime Minister Fuad Saniora said in an interview published Thursday in Italy, and he asked for international hope. But his office later said he had been misquoted. The Israeli army dropped leaflets on towns and villages in the Gaza Strip on Thursday, warning residents that anyone with an arsenal of weapons in their homes would be attacked. The Bush administration wasn't the only government being criticized for its evacuation efforts. About 200 Australian citizens hoping to flee Lebanon were left stranded on a Beirut dock overnight after a Greek navy ship was forced to sail without them. Australian Foreign Minister Alexander Downer said Israel had set a deadline for the ship's departure and had refused to guarantee its safety after that time. Russia sharply criticized Israel over its offensive against Hezbollah guerrillas in Lebanon on Thursday, saying its actions have gone "far beyond the boundaries of an anti-terrorist operation" and repeating calls for an immediate cease-fire. A group of about 40 U.S. Marines arrived at a beach just north of Beirut in a landing craft and picked up 300 Americans, who they ferried to the amphibious assault ship USS Nashville, sailing just off the coast. Part of a task force carrying about 1,200 Marines, the Nashville hopes to sail for Cyprus with about 1,000 Americans. Around 8,000 of the 25,000 Americans in Lebanon have asked to be evacuated. The Hezbollah militants fighting Israel are declared enemies of the United States and the group is blamed for the Beirut suicide bombing that killed 241 Americans at Marine barracks in 1983. All U.S. forces withdrew within months, and there has been no American military presence since. "It's not a mystery that Hezbollah answers to the political agendas of Tehran and Damascus," Saniora was quoted as saying by Milan-based newspaper Corriere della Sera. "The entire world must help us disarm Hezbollah. But first we need to reach a cease-fire." But his office said he had been misquoted. "What the prime minister said was that the international community has not given the Lebanese government the chance to deal with the problem of Hezbollah weapons, since the continued presence of Israeli occupation of Lebanese lands in the Chebaa Farms region is what contributes to the presence of Hezbollah weapons," the statement said. "The international community must help us in (getting) an Israeli withdrawal from Chebaa Farms so we can solve the problem of Hezbollah's arms." Chebaa Farms is a disputed territory that Lebanon claims and Hezbollah uses as a pretext for attacking Israeli forces. Residents of Haifa, Israel's major port, were taking the frequent Hezbollah rocket attacks in stride. "I've been through a lot more and it's really not so scary unless it's on your head," cab driver Uri Schreiber told Berger. He and others in Haifa say the army should do whatever it takes to get his paralyzed city back to normal. "One hundred percent behind it. I think it should have been done earlier. Can't stop until you finish the job," Schreiber said. Twenty-nine people had been killed on the Israeli side of the border, including 14 soldiers and 15 civilians. About 300 people have died and 1,000 have been wounded in Lebanon, with half a million people displaced. Former Israeli defense minister Shaul Mofaz said on Israel's Army Radio Thursday that about 50 percent of Hezbollah's arsenal of weapons and buildings has been destroyed by the Israeli offensive. Israeli Brig. Gen. Alon Friedman gave the same estimate on Wednesday. "The fighting in the north ... could last much longer," Lt. Gen. Dan Halutz, the army's chief of staff, said in a letter to soldiers and offiers. "We are being tested at this time. Our moral strength and value will reflect on the state of Israel and its residents and on their ability to continue to stand up to the threat on the front." The letter was released to the media several hours after Hezbollah guerrillas wounded three Israeli soldiers in two separate clashes in southern Lebanon on Thursday, the army said. "The Zionist enemy soldiers are trying in vain to advance toward the Lebanese territory to achieve any military victory. Again, the men of God (Hezbollah) confronted them and proved to it (Israel) that it is an army without soldiers," Hezbollah said in a statement faxed to The Associated Press. "Two Merkava tanks were destroyed during the clashes, which are still raging on." The United Nations Security Council, along with Secretary of State Condoleezza Rice, was scheduled to hear a report from a U.N. diplomatic team just back from the Mideast. "The difficulty for world leaders gathered at the U.N. will be to find a negotiated solution that includes an end to the violence at the same time as it reduces the continuing threat of Hezbollah attacks against Israel," says CBS News foreign affairs analyst Pamela Falk.